From left: Fire Chief KC Hume, board member Rodney Kowach, administrative assistant Tonya Mercer, Treasurer Chris Nichols, President John Forgay and board member Alan Webber at the Craig Rural Fire Protection District monthly board meeting Thursday. 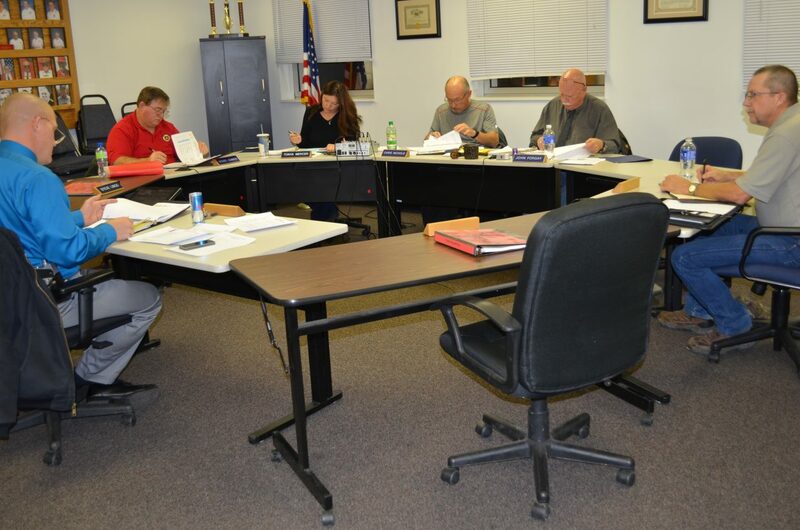 The Craig Rural Fire Protection District board held its monthly meeting Thursday night. Directors present included Fire Chief and Sheriff-Elect KC Hume, Sgt. and Board President John Forgay, Board Treasurer Chris Nichols, administrative assistant Tonya Mercer, board member Alan Webber and board member Rodney Kowach. Reports from Hume included information about recruitment this year. Hume said the department held its informational meeting for rookie firefighter candidates Wednesday. “Things are moving along, all things considered, in recruitment,” Hume said. The district has had trouble holding on to recruits in the past. Hume also said the 2014 rookie academy is almost finished for the year. One recruit will take one more written test before it is officially complete. The fire chief also wants to help the board “go a bit more green.” With some unspent money in the information and technology line item of the budget, Hume wants to purchase tablets for board members to use instead of printing documents for the monthly meetings. All documents will be pushed to “the cloud” and board members will be able to access them anywhere in advance of board meetings. Hume said the electronic document process will be much like the one used by the Moffat County School District Board of Education. The Oct. 16 board meeting minutes were approved, 6-0. Bills in the amount of $59,707.63 approved, 6-0. The fire department bills were $41,419.61 with $18,288.01 in hazardous materials bills. Admin policies 01, 16 and 31 were approved on their second readings, 6-0. All three policies involved updating or changing language in current policies regarding purchases. The Craig Rural Fire Protection District 2015 budget was approved, 6-0.